Click any of the links below to be taken to each question. 1. What is your current turn-around time? 2. Can I skip ahead in line if I need something from you sooner? 3. Why do you start your turn-around time from the time you receive my breast milk and not from the time I place my order? 5. How much breast milk do you need for one of your designs? 6. What exactly is breast milk jewelry? 7. I've seen breast milk jewelry that goes bad and spoils over time. Does the breast milk jewelry you create change color over time? 8. How will I ship my breast milk to you? Will you give me instructions? 9. Does my breast milk need to be frozen or kept cool on its way to you? 10. Are you pretty organized with your customers' breast milk? I am paranoid that I'll get a piece of jewelry that isn't from my own milk! 11. I've had breast milk frozen for several years and I'm sure it's probably gone bad in the freezer. Can you still use this for breast milk jewelry? 12. Do you take international orders? If so, how do I ship my breast milk to you? 13. How long does the average order take to get to the UK once completed? To Canada? To Germany? 14. How is the milk solidified to make jewelry? 15. How much does it cost to ship my breast milk to you? 16. Is it legal to ship breast milk using the postal service? 17. Do you have a refunds and cancellation policy? 18. What is your official guarantee and policy on repairing your jewelry? 19. Is there a time limit on how long I can wait to send my breast milk or material to you? What happens if I wait to send my milk to you and my setting is discontinued or no longer available? 20. I have a design idea or existing pendant I'd love for you to use. Can you do custom orders? 21. have such a low milk supply. Can you use less than 2 TBSP (30 mL) for a breast milk ring or pendant? 22. Do you have any suggestions for increasing breast milk supply so I can send you the needed amount? 23. I see you offer Gift Certificates. Can you give me more details about that? This really depends on how many customers I have ahead of you in my queue. I work on jewelry pieces in the order I receive the breast milk and holidays/busy times like Mother's Day, World Breastfeeding Week, and Christmas will see a longer wait time. I custom-ake every piece of jewelry myself, and take the time to make sure every customer receives the highest-quality piece possible. Current turn-around time is ***estimated*** between 5 and 10 weeks from the time I receive your breast milk, though some orders can take more or less time to make. The current projected wait time is 6 to 10 weeks **roughly** (as of 10/08/2018). I cannot guarantee a wait time, however, so keep in mind that these are just estimates and this is subject to change depending on the amount of orders I have in my queue at the time your breast milk is received. There are certain items that might fall outside of this timeline, and this will be noted on those specific products' pages. I do try to keep this wait time as accurate as possible, and the wait time can vary greatly depending on sales, promotions, and a large influx of orders at one time. Wait times will be increased after certain holidays/celebrations including Mother's Day, World Breastfeeding Week, Black Friday, and the month leading up to the Christmas Holidays, as we typically get a larger influx of orders and mothers mailing their breast milk to us at these times. For non-breast milk jewelry pieces, the average turn-around time is currently 6 weeks from the date that I receive the materials needed for your order. If you order a breast milk jewelry piece and a non-breast milk jewelry piece, your non-breast milk jewelry piece will be shipped along with your breast milk jewelry when it is completed unless you request to purchase extra shipping for shipping two pieces out to you separately. Please note that we've recently added the benefit for ALL orders above $750 to automatically receive FREE Expedite Your Order (a $75 Value!) and it will be added to your cart at checkout; see below (question 2) for details on the Expedite Your Order timeline. PLEASE NOTE: Free Expedite Your Order does not apply to Payment Plans. You will receive your item once the Payment Plan is completely paid off. Can I skip ahead in line if I need something sooner from you? I do have two faster options available to you at this time. Both options are available in the Extra page of my website. The highest-priority is Super-Rush order. With this option, you have the guarantee that your breast milk jewelry will be started as soon as possible (usually upon receiving your breast milk). Depending on the piece, the average turn-around time for this is 4-14 days. Some pieces may take a little outside of this timeline, but these pieces of jewelry will have a notation on the product page to that effect letting you know that Super Rush may be delayed. The Timeless Crown Collection is not available for Super Rush due to being hand-cast by our goldsmith. Super-Rush shipping can be found here: http://www.breastmilkjewelry.com/super-rush-delivery-highest-priority/. It is recommended that you choose Priority or Express shipping at checkout in order to receive your jewelry quicker. Please note that Super Rush will depend on stock-levels of items ordered, as well. I do keep most items in stock, but if an item is in particularly high-demand (it will be noted on the product page), then it may take longer to arrive to you. The Expedited option guarantees that your breast milk jewelry will be started sooner than normal-priority orders and after any Rush Orders, with an average turn-around time of 3-6 weeks (though this turn-around time is subject to change). This option can be found here: http://www.breastmilkjewelry.com/expedite-your-order/ Please note that Expedite Your Order will depend on stock-levels of items ordered, as well. I do keep most items in stock, but if an item is in particularly high-demand (it will be noted on the product page), then it may take longer to arrive to you. Please keep in mind that I will ship your jewelry piece to you according to the shipping preferences that you choose at checkout. If you need something Express-shipped to you (and you live in the US), please select this at checkout. Why do you start your turn-around time from the time you receive my breast milk and not from the time I place my order? The main reason I do this is that it is the most fair way I know to add people to my queue. Some mothers send me their breast milk right away, while others wait weeks or even months before they send me their breast milk. For example, if a mother orders in January and sends me her breast milk in March, her order will not be made before the person who sent me their breast milk in February. I am located in Arizona, USA. I accept customers worldwide! How much breast milk do you need for one of your designs? ​I have perfected my breast milk jewelry technique so that I only require a very small amount of breastmilk to make a piece of jewelry, usually 2 Tablespoons (30 mL) of breast milk. For each additional breast milk item you'd like I need an additional 2 TBSP of milk. What exactly is breast milk jewelry? Breast milk jewelry is jewelry made using a mother's own breast milk to commemorate her nursing journey. It gives her a tangible reminder of the time they spent nursing and bonding with her little ones. I've also made breast milk jewelry pieces for surrogate and birth mothers, milk donors, and family members of a nursing mother, as well, to honor their contribution to a family's life. Does your breast milk jewelry change color over time? The great thing about my breast milk jewelry is that it does NOT yellow or change color over time. When ordering from me, you can be sure that your breast milk jewelry will retain its color for as long as you have the piece. Our breast milk jewelry will not disintegrate in water, go moldy, or change color over time (unlike some others). How will I ship my breast milk to you? Will you give me instructions? Once you place your order, a link to full and detailed instructions on how and where to ship your breast milk will be prominently displayed on your order confirmation page just above your order number. You will also receive an automated e-mail with the same link to the instructions in case you missed them on the order confirmation page or are ordering while mobile. 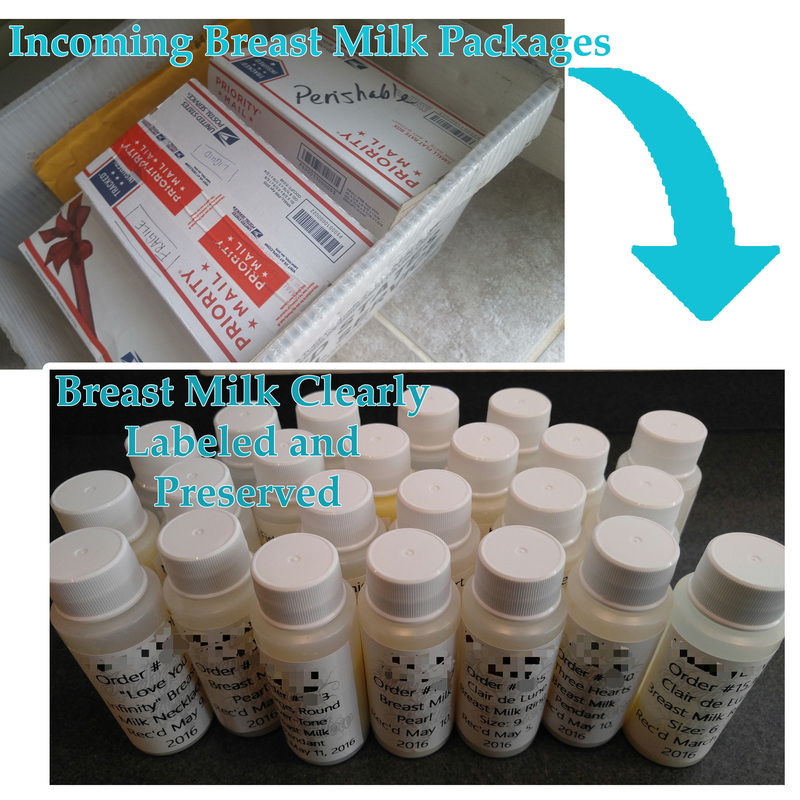 Your breast milk can be easily shipped using a small box or padded envelope. Breast milk storage bags work great for shipping as they rarely leak in-transit, but if you don't have those, high-quality freezer bags work, as well. Only 30mL (1 ounce) of breast milk is needed per jewelry piece. There are additional instructions, but this is the gist of the shipping details. Does my breast milk need to be frozen or kept cool on its way to you? For my purposes, no. Breast milk actually has amazing properties that allow it not to spoil very quickly. With that said, since no one will be consuming the milk, we are not worried about spoiling at all. If you choose to, you can certainly use breast milk that has been previously frozen. Just make sure that it is completely thawed before shipping to me. Condensation from the outside of your frozen breast milk can cause your package to rip in-transit. Are you pretty organized with your customers' breast milk? I am paranoid that I'll get a piece of jewelry that isn't from my own milk! Upon arrival, your breast milk is removed from the package along with the customer form that you send with your milk (you receive the form in your e-mail after checkout). We double check your order number, name, and the items ordered at that time. Your milk is then added to a sterile container, and we print a label for your container of milk with your name, order number, the item ordered, and the date your breast milk was received. Your breast milk is naturally preserved at this time for use later and then it is stored alphabetically by last name. I never work with more than one person's milk at a time! I've had breast milk frozen for several years and I'm sure it's probably gone bad in the freezer. Can you still use this for breast milk jewelry? Yes, I can still make breast milk jewelry from breast milk that has been frozen for years. This doesn't affect my process.The oldest breast milk I've ever worked with was frozen for 18 years, and the mother's jewelry turned out beautifully! Do you take international orders? If so, how do I ship my breast milk to you? ​I accept orders worldwide and serviced people as far as Singapore and Malaysia. Instructions for specifics on shipping your breast milk will be provided to you after you purchase your breast milk jewelry. Your breast milk should be shipped via regular Airmail. I strongly encourage moms to use their local post office for shipping breast milk to me and to be sure that whichever way they choose to ship, that they choose a service with tracking information included and not added on. There aren't any restrictions on shipping human milk internationally (only cows' and goats' milk are prohibited). To be on the safe side, omit the information that your package contains breast milk. You're not shipping anything dangerous or biohazardous, so simply mark your customs form as a gift and check a box unrelated to the contents of your package. How long does the average order take to get to the UK once completed? To Canada? To Germany? The UK: It takes anywhere from 8-12 days to get from my location in KS, USA to most places in the UK depending on how remote your location is. The average is about 10 days. Canada: It takes about a week for most shipments to reach my customers in Canada. Europe main-land: It takes about 12 days on average for a shipment to reach my customers in most places in Europe. Far East --Singapore, Malaysia, Thailand, Indonesia, etc.-- : The average is 15-18 days, but depending on your specific location and how remote you are, it can take a few days longer. Australia: Average is about 10-15 days from the time I ship but I've seen packages delivered in as little as 8 days. How is the milk solidified to make jewelry? It took me almost a year to figure this out! What I *can* tell you is that your breast milk is naturally preserved and hardened to form whatever I need to make your breast milk jewelry. My proprietary method is unlike anything anyone else is doing! Your breast milk jewelry will not disintigrate or change color over time (unlike some others). How much does it cost to ship my breast milk to you? Since no special handling is required for shipping your breast milk to me, it should be quite inexpensive for you. Shipping costs vary depending on package size and weight of the package, but generally speaking, in the US it costs roughly $4 to $6 to ship breast milk using Priority shipping (the preferred method for shipping). Shipping from outside of the US varies depending on country. Is it legal to ship breast milk using the postal service? Yes, absolutely! Breast milk is permitted in post provided you package it correctly. In the United States there are no special rules regarding the shipment of breast milk. If you are outside of the US you will be given detailed instructions on how and where to send your breast milk. Do you have a refunds and cancellation policy? You may cancel your entire order with a full refund within 5 days after purchase if you have not already sent your breast milk to me. Once I receive your breast milk, it is naturally preserved and I order the pieces required to make your custom piece of jewelry for you. If you would like to cancel your order after you've already sent your milk, you may do so within 90 days from purchase for a fee of 15% of the purchase price (my time and materials used for preservation do factor into this percentage). After 90 days, no refund will be issued. If you decide to cancel your order and I have begun making your breast milk jewelry, you may receive a 40% refund, and no preserved breast milk pieces will be sent to you. If you decide to cancel your order after I have completed your piece of jewelry, no refund will be issued. I can either ship your breast milk jewelry to you or dispose of it for you. I will not refund if your order was shipped to an incorrect address. Customers are expected to enter a correct shipping address at checkout, so please try to have your correct address on-hand when checking out. I do my very best to update shipping addresses for customers if they've moved, but cannot refund for incorrect shipments based on a new address. What is your official guarantee and policy on repairing your jewelry? I have perfected the technique to preserve and harden your breast milk, and your breast milk stone comes with a guarantee that it will not discolor, go moldy, or disintegrate over time, barring that you treat your jewelry the way we recommend you do (don't store your jewelry in directly sunlight or in a hot environment, don't store your jewelry in an unusual place like a shoe box, purse or bag, or medicine cabinet, don't expose your breast milk stone to water for a long period of time, don't use perfumes, lotions, or cleaners on your jewelry, etc.). If you do decide to store your jewelry long-term, it should be stored in an air-tight container with an oxygen-absorbing agent and it should be gently cleaned of tarnish regularly. Is there a time limit on how long I can wait to send my breast milk or material to you? What happens if I wait to send my milk to you and the setting is discontinued or no longer available? There is no time limit for your order and I will not cancel your order after a certain period of time, however, I do prefer that you send your breast milk or other material to me within 90 days. The reason for this is that any settings or pieces required to make your custom jewelry are more likely to be in stock and not discontinued in this time frame. If you do wait to send your milk to me and the setting is discontinued or no longer available in that time-frame, you will receive store-credit for the setting towards the purchase of another setting of equal or greater value. I have a design idea or existing pendant I'd love for you to use. Can you do custom orders? I used to do custom designs, but due to being overwhelmingly busy, I no longer have time to price out individual custom orders and will no longer take custom orders. This does not mean that I will not eventually add a design like the one you're wanting, so feel free to e-mail me with any design ideas you'd like to see my store offer in the future. I have several designs that were born of customer requests, so let me know what you'd like to see! I have such a low milk supply. Can you use less than 2 TBSP (30 mL) for a pendant? It is possible to do for a smaller pendant. Sometimes I can use as little as 1 TSP (5 mL). Contact me by using my Contact page or e-mailing me at info@breastmilkjewelry.com if you're having a supply issue and I'll help guide you to a design that might work for you. Do you have any suggestions for increasing breast milk supply so I can send you the needed amount? Hand-expressing milk works best. You can also collect a few drops of milk each day and build from there. Since we're not concerned about the milk spoiling, it can be collected for weeks before shipping to me. Here's a link to my blog with tips for increasing milk supply! I see you offer Gift Certificates. Can you give me more details about that? When ordering a Gift Certificate from my store, it is important to keep in mind that the e-mail address requested for the recipient is where the gift certificate will be sent immediately upon completing your order for a gift certificate from our store. If you do not wish for the person recieving the gift certificate to get this e-mail from us yet (such as in the event of the Holidays or a birthday that has yet to pass), we definitely suggest that you add your own e-mail address into the recipient's e-mail address field, this way you can pass along the information to the giftee at the time you wish to present them the gift certificate. Once you place your order for your gift certificate, you (or your giftee) will receive an e-mail from our store stating that they have received a gift certificate from you, instructions on how to redeem the gift certificate, and the gift certificate code itself, which can be entered at checkout. I understand that the material you send me is precious to you, but some things cannot be controlled. By purchasing from me, you understand that Kyra Brooks and Indigo Willow, LLC cannot be held responsible for lost, stolen, or damaged materials due to fire, flood, theft, earthquake, tornado, blizzard, or any other Act of God. For this reason, I do ask that you do not send me all you have of your material (be it breast milk, ashes, placenta powder, hair, etc.). This is to ensure that you are able to have a back up should something happen and you need to send more of your material.